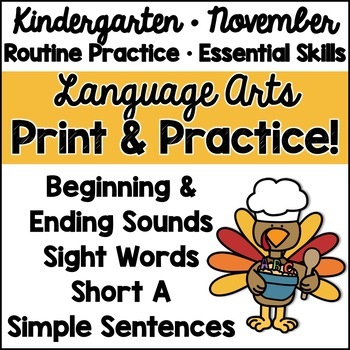 A basic sight word sentence cut, scramble, and paste using one of two sentence stems. 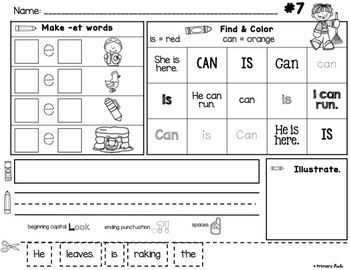 For advanced learners, they can compose their own sentence rather than copy. Short A Word Family pictures with missing beginning sounds (5) and missing beginning ending sounds (5). The pictures are repeated to build fluency and familiarity. 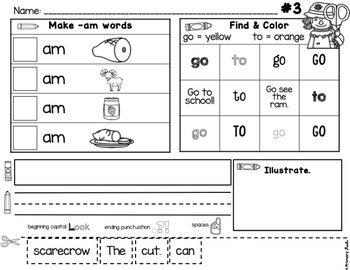 A "color by sight word" grid reviewing two basic sight words daily to assist with visual discrimination. My students love these and I love the formative assessment they provide. 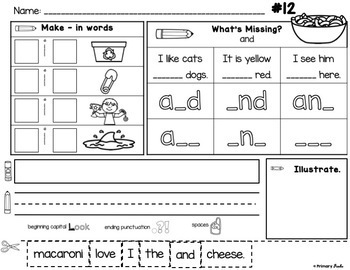 I struggle to find easy-to-follow worksheets that cover multiple skills -- cutting, handwriting, sentence structure, sight words, early phonics, and sight words. Rather than hand my kids boring stacks of worksheets, this one-and-done approach keeps them accountable for practicing essential skills before they can move into centers. Great for homework or small groups!